This group of birds, which includes tyrant flycatchers (Tyrannidae) are considered the largest family of birds on Earth, with more than 400 species. The Phainopepla is not a member of the tyrant group. Species include here are Alder, Ash-throated, Dusky, Gray, Hammond’s, Least, Olive-sided, Scissor-tailed, Sulphur-bellied, Vermillion and Willow Flycatchers, along with Black and Say’s Phoebes, Cassin’s and Western Kingbirds, Western Wood-pewee and the aforementioned Phainopepla. 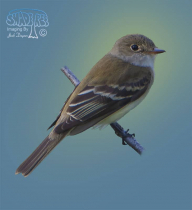 Formerly lumped with the Willow Flycatcher as the Traill's Flycatcher, the Alder Flycatcher has been full species status. The split occurred in 1973. 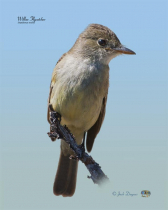 Sightings of the Ash-Throated Flycatcher are not uncommon in the western US. These birds breed in desert scrub, riparian woods, brushy fields and open woods from the western United States to central Mexico. One of my favorite birds, the Black Phoebe is often seen in the southwestern USA. They are not especially migratory, and their range is coastal California, southern Arizona and New Mexico, most of Mexico and Central America, and parts of western South America. 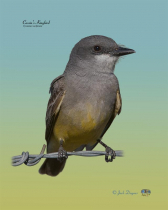 The Cassin's Kingbird is commonly found in Southern California year round. Their breeding range includes the southern Rocky Mountain states (Arizona & New Mexico) and south into central Mexico. I first met this bird at the Arivaca Cienega. 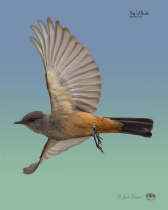 It looks very much like the Ash-Throated Flycatcher, bur sounds very different. 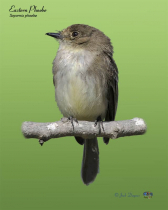 The Dusky Flycatcher is found in chaparral, stream-side thickets, and open brushy areas. It is extremely difficult to tell from Hammond's Flycatcher by appearance alone. 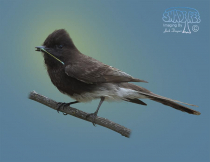 These images of the Dusky Flycatcher were gathered on Santa Rosa Mountain, in southern Riverside County, in California. 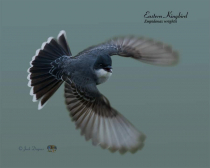 Seen over most of the US, *EXCEPT* in most of the west, these Eastern Kingbirds were found near Saskatoon Lake in Alberta, Canada, Jackson Wyoming, and Payette Idaho. The Eastern Phoebe's normal range is pretty much east of the Rocky Mountains. Summer's find them north of the Mason-Dixon Line all the way into the southern zone of the North-West Territory. This individual must have lost its way and spent the winter in the Tijuana River Valley in San Diego County. 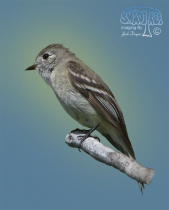 The Gray Flycatcher is found in brushy, arid habitats. This bird breeds in the Great basin in sage country and winters in much of Mexico. 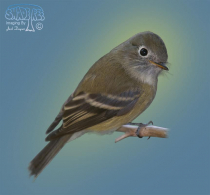 Very similar to the Dusky Flycatcher, the Hammond's Flycatcher occupies higher elevation conifers, while the Dusky lives more in lower Chaparral. The Least Flycatcher is a bird of the east, but nests in the north as far west as Montana, Northern Idaho and eastern British Columbia. 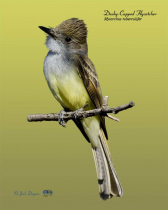 The Olive-sided Flycatcher is usually seen when perched at or near the top of a tall tree or snag. These birds breed across most of the western USA, Canada, Alaska and in the Appalachian Range. 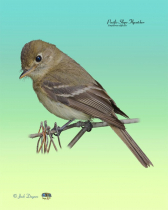 The Pacific-Slope Flycatcher is a member of the "Western Flycatcher" complex. It was split, along with the Cordilleran Flycatcher, in 1989. Not all scientists agree on this split. 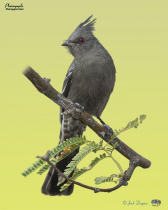 The Phainopepla is considered a "Silky Flycatcher", a group of birds typically of tropical Central America. I found this Scissor-Tailed Flycatcher at Piedras Blancas beach while photographing new baby Northern Elephant Seals. As a rarity in California, word got out quickly and folks came from far and wide to see this bird. I donated one of these images to Cal Poly as a contribution to the scientific record. 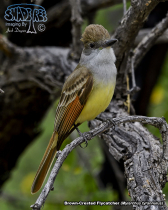 Rarely seen in the US, the Sulphur-Bellied Flycatcher is a summer resident of western Mexico, but is a regular summer visitor to the Huachuca Mountain broad-leaf forest canyons. 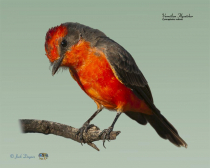 The Vermillion Flycatcher is a strikingly handsome bird. It is found in Mexico and open brushy areas near water in the South-Western US. 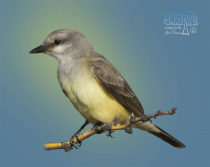 Truly a bird of the Western US, the Western Kingbird can be found in the summer in nearly every state west of the Mississippi River. 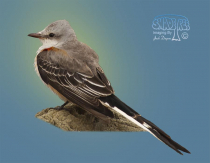 In former times, this bird was called the "Arkansas Kingbird." 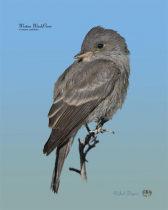 The Western Wood-Pewee is often found conspicuously perched in the woodlands of Western USA, from Texas, west to California, and north to Alaska and the prairies of Canada. Formerly lumped with the Alder Flycatcher as the Traill's Flycatcher, the Willow Flycatcher has been given full species status. The split occurred in 1973.